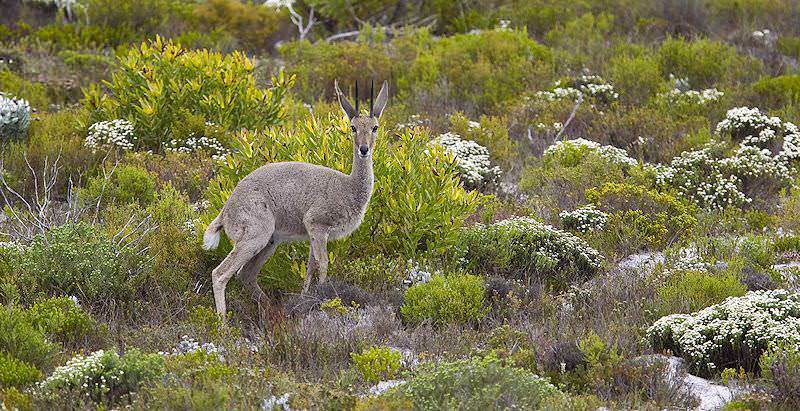 The grey rhebuck is endemic to South Africa and enjoys the mountainous areas of the Cape. Grey rhebucks have pale grey fur all over their body, with the exception of their underbelly and parts of their legs and face, which is colored white. They have long, slender ears and faces and black ball-like noses at the tips of their respective faces. Males have straight, medium sized horns on their heads that resemble stakes or spikes standing roughly 20cm from their heads. The sexes are mainly distinguished by their horns or lack thereof. Average weights range from 19 – 30kg (42 – 66lb), and heights ranging from 70cm – 80cm, with males slightly larger, roughly a tenth larger than females. This is one of the few species of Antelope that can only be found within the borders of South Africa. It dominates the high edges of the Plateau in the biggest mountain range of Sub-Saharan Africa, the Drakensberg Mountains. These Grey or Vaal Rhebok as they are sometimes called, usually find themselves living in areas above 1000m from sea level, although in the Western and Eastern Cape Provinces they are found at very low altitudes near the coast, contradicting their pattern of living in mountainous areas only. Grey rhebucks have many stable populations in protected areas throughout the continent, and it is thanks to this that they aren’t in any threat currently. The mountainous areas in which they frequently reside are also usually outside the harmful reach of human communities which may over-hunt and inevitably wipe-out the local population. The estimated total number of Grey Rhebok individuals is 18 000 although only 9800 thereof is known for sure, because of the remote nature of the areas in which the remainder of the Rhebok find refuge. Some of their strongest populations inhabit parks within both the northern and southern Drakensberg Mountains; roughly 3000 individuals in UKhahlamba-Drakensberg Park alone. These Rhebok are linked with grassland and scrub savanna areas, which frequently occur on the high mountains and slopes they are found within the Drakensberg Mountain range. They both graze and browse, and move from nutritious pastures on higher hills and slopes during the rainy season in September – March, to lower grassland slopes in the dry season when higher slopes lose their sustenance and become barren during the winter from April – August. They are also water independent, which means they consume enough moisture from browsing and do not need a stable source of drinking water to survive. Rhebok organize themselves into herds of roughly 5 members and climbing, consisting of 1 adult male, with the rest being made up by female antelope and their young. They are territorial animals, and use their territory as a home range. Females and their young will usually stay within one male’s territory and will then exclusively mate with that ram or male Rhebok. Groups like these are frequently referred to as harems or one harem. Territories change with seasons, and range anywhere from 25 – 100 ha in area (0,25 – 1 square kilometer). These creatures don’t form bachelor groups at all; instead, juvenile males remain on the sidelines until they are able to gain their own territory. Their open environment or habitat has made them very dependent on sight. They can spot stationery objects from over 200m away, and can spot fellow Grey Rhebok from almost 400m away. They do make sounds, a grunting noise when attacked or threatened for example. Males frequently patrol their territory, leaving their scent in the form of feces and urine. They also have an acute sense of smell and can follow other individuals of the species simply by keeping track of their scent. A ram male chase away other males when they approach his territory and the pair may even engage in battle in which they use their horns, like most other antelope. Breeding between members of this species is seasonal, between January and April, to ensure calves are born when lots of nutritious food is abundantly available during the months of November, December and January. They have very odd mating rituals, where they lick each other, and the male lifts his foreleg between the female’s two hind legs, before copulation. Females carry young for a 7 month period. This species of Rhebok is most probably the only African antelope species to have been recorded given birth to 2 offspring at a time, although this is still very rare. These rhebucks are fortunate in the sense that there are not big predators that can generally be found around their territories. The only antagonists for the life story of a Gray Rhebok are caracals, jackals and baboons in addition to humans off course. Calves are also easy prey for large predatory birds such as some eagle species. When threatened they snort, stamp and raise their posture to seem bigger, but inevitably run when it comes to it. Their average flight distance is between 150 and 200m. Even when threatened, herds of Grey Rhebok prefer not wondering outside their territory and avoid it as far as possible. During an attack, the male does sometimes go on the offense to protect his herd. South Africa travel is characterized by extraordinary diversity. Travel to Botswana for an authentic safari in a pristine wilderness area. Namibia is known for its exhilarating desert-oriented safari activities. Zambia's most popular safari destinations are Kafue and South Luangwa. Travel to Zimbabwe for a truly dramatic perspective of the Victoria Falls. Mozambique is one of the continent's finest beach vacation destinations. The Kruger National Park is a vast wilderness that stretches of a two million-hectare corner of South Africa. The Sabi Sand is sought after for its choice collection of luxury safari lodges and prolific game viewing opportunities. Cape Town is a captivating city replete with cosmopolitan charm and breathtaking natural beauty. The Garden Route is one of South Africa's most exciting tour destinations, flush with opportunities for adventure.